The Great Green Macaw is one of the heaviest parrots at 1300g (nearly 4lb). A.a. ambiguus: Both adults yellow/green body colour; forehead and lines on lores red; throat tinged with olive/brown; uppertail orange/red tipped with dull blue. Bill dark grey tipped with pale grey; bare face pink/white with lines of olive/brown feathering. Eye dull yellow. A.a. guayaquilensis: Both adults as in ambiguus, but with smaller, narrower bill. As in adult but duller and with shorter tail tipped with yellow. Eye grey. Loud squawks and growls; also creaking or groaning sounds. Parrots: Status Survey and Conservation Plan 2000-2004, Synder, McGowan, Gilardi and Grajal, 2000. Kept in captive breeding programmes. A large enclosure 15m (50 ft) long in off breeding season - keeping permanently indoors not recommended. 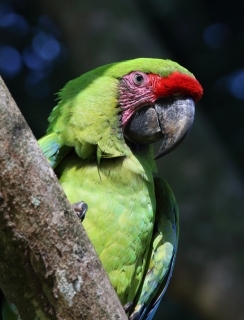 Soaked or sprouted sunflower seed, walnuts, peanuts, pecans, Brazil nuts and pine nuts; fresh corn, cooked maize; fruits such as banana, oranges, and nutritionally complete kibble for macaws. Large aviary with tree trunk in middle decorated weekly with fresh branches of pine or eucalyptus, large chewable toys made for macaws; also provide overhead misters for bathing. Intolerant of habitat destruction. Also shot as a crop pest and caught for wild-bird trade. A.a. ambiguus: Caribbean lowlands of E Honduras to W Colombia and W Ecuador. E Nicaragua to lowlands of Costa Rica mostly on Caribbean slope. In Panama on Caribbean slope; from E Panama to tropical zone of Colombia and parts of the Andes. A.a. guayaquilensis: W Ecuador, in north, Esmeraldas, in S Chongon Hills. Lowland humid forest; also strongly deciduous forest. In Costa Rica lowland primary forest. Reaches 600m (1968 ft) in Costa Rica, 1000m (3280 ft) in Panama. Recorded food items include seeds, nuts, fruits, flowers, bulbs, roots and bark. Seeds of almendro (Dipteryx panamensis) a major part of the diet. Less gregarious than other large macaws; found in pairs and groups of 3-4 birds. Rest and forage in upper areas of canopy where they are less obvious. Will fly long distances to reach feeding areas. 3 elliptical eggs 55 x 45mm (2.1 x 1.7 in). August-October in Ecuador, dry season (December-April) in Costa Rica.